I’ve been absent. Absent in the sense that I should know who Jack Ladder is. Well, of course, now I do. Ladder is a chameleon of sorts, a singer whose voice never really deviates fromn its locked in persona of cool. The influences are obvious, too… there’s a little Brian Ferry, a little Chris Isaac and a kind serving of Nick Cave (to strengthen things physically, Ladder, too, is tall and lanky with matching suit to boot). Thing is, this is the lounge act that Nick Cave could truly aspire too (though, he may be too far into his game to carry it with Ladder's sense of authenticity. It's an ongoing effort, not just a sideline dance). I use the term ‘lounge’ with great affection (it's more in frontman delivery than overall sound). Is it all character? Perhaps. But that’s showmanship. The band, the Dreamlanders, truly act as Ladder’s dream band… as if he’s conjured them up to convey his musical vision to perfection, session musos let loose on the town. Watching Ladder play off the stand-in-one-spot bassist was fun. Again, I’m new to the Ladder game, so I don’t know just how far the in-band collaboration travels... is it all Jack as magician with kindly nods to suggestions? It took a song or two to get me in the mood (? )… but, once there, I was amazed. I was hooked. Perhaps I was struck dumb a little early on, some keys on the opening track hinting at prog-rock (fear not, it wasn't to be). From tracks that would find a home in any 80s Tony Scott film (minus, perhaps, The Hunger) to the gorgeous 'To Keep & Be To Kept’ (how can you go past a lyric like ‘Since we’ve met, border patrol has become undone’? ), Jack Ladder & The Dreamlanders are sharp in sound and beautifully thoughtful (when they want to be). I understand they were missing their usual lead guitarist on the night.... the chap who filled in was without fault. All the way from Lititz, Pennsylvania (which, as I discovered, is about one and a half hours drive from Hatfield… which I’ve been to. Not sure why I mentioned that, but you know me… I like to get personal), The Districts sound checked their way through the buzz of an expecting crowd. I love these sound check moments (albeit, brief), that chance to catch rockers off guard as they battle for perfection, requests made over the keeping-the-restless-at-bay P.A. music. There’s a desperate sense of energy, onstage persona involuntarily stripped back. It’s real. Maybe I’m just studying a little too much. Anyway, when it was time to roll, The Districts had their audience right in the pocket. An off-kilter start (soundwise) didn’t deter things, they found their zone quickly enough. And by the time Hounds kicked into gear, they were truly in business. Funny, I half expected a Weezer cover (a’la El Scorcho) with the intro to Hounds, not being too up on their sound. A little haggard, a little worn… incredibly honest. 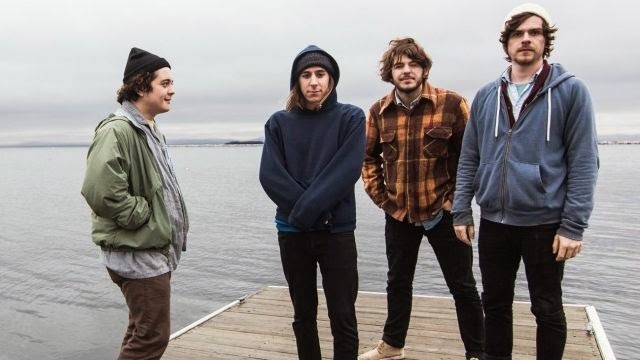 And, despite a trip or two into sound waffling, The Districts deserve points for their dedication, their continued energy (frontman Rob Grote, especially). They delivered in an atmosphere that was truly welcoming.